We notice some differences about the search filter between SAO and GTK Client. On GTK CLIENT the focus is not set when opening the form. So the form search is not close when switching between tabs. On SAO there is a search icon on the search bar (LOOK GLASS) to refresh data with filter. Not present on GTK CLIENT. We would like also improve some features. It is not possible to use operator (>,<,=,!=) on the search form for a numeric field. 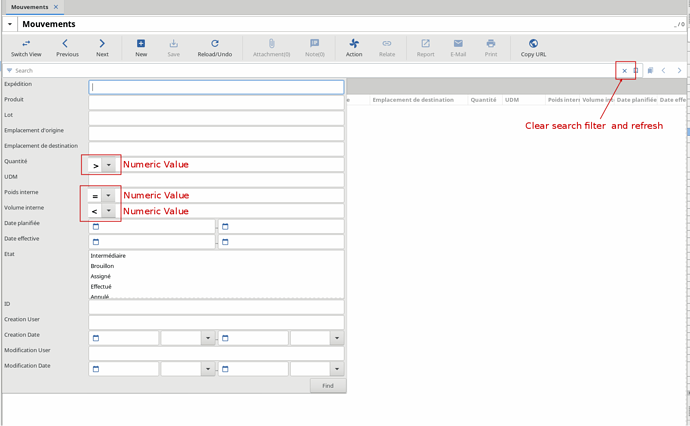 On the GTK CLIENT set the focus on the first field when opening the form. Now the form has not the focus. On the GTK CLIENT, add an icon LOOK GLASS on the search bar. I think I’d be better to have two fields so the user can put “from value” - “to value”. Just like with date fields. And for the equal, you should write same value in both fields? Here the focus is set on the first field and there is a call to grab the focus. GTK allows only one icon each side of an entry, that’s why there is no other button for now. Here the focus is set on the first field and there is a call to grab the focus . I checked the Google behavior. They have a clear search button that appears when the input is filled but only on mobile device. I think the rational is that on mobile it is difficult to clear the text but on desktop is it easy. I’m wondering if the behavior could not be improved by filling the second part automatically when the first is filled. So this will make the default operator being equal until the user change or remove the second part. The automatic filling should only happen when the first part is changed from empty to something.